When I connect the battery the red led lights up and the IR led lights up too. I provided some pictures of my build. anyone an idea what i did wrong? The PCB back looks good, so all connections should be fine (as I'm able to see on your pictures). But you're not using the parts of the IR-Repater kit, so I can't see, if you've really soldered the right electronic parts. Please double check, if all parts are 100 percent equal to the parts from the IR-Repeater solder guide or the corresponding IR-Repeater Kit. Otherwise it's necessary to adjust the circuit. And the 47 kOhm resistor should be an 47 Ohm resistor, but I think you made a typing error, don't you ? Last but not least take a look at your parts and not at your order list, to make sure you received the right parts from your local dealer. Yes that was a typo,i have the 47 Ohm resistor. is there any way to adjust the schematic? or is replacing the sensor with the correct one the only option? 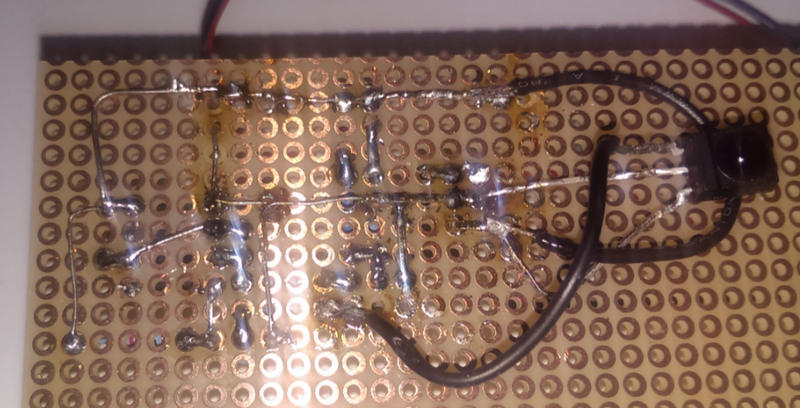 So you should adjust the 3 pins from your ir receiver to the circuit. anything else that i should do? Sounds not very good, may be the IR module is broken by the wrong connections. So no LED light, when you press a button on your remote ? Don't hesitate to post a picture of your new circuit, may be there's a new failure. When i disconnect the battery, both the led and the ir-led light up. There're some solder connections which are looking not really nice, but it's difficult to determine them on your picture. So I would suggest, that you take a few minutes and resolder all points where you're unsure if they're connected.